Top Daily Fantasy provides everything you need to get started with Daily Fantasy Sports, including the top bonuses and promotions. TDF not only provides you with the best bonus codes and deals available at the top Daily Fantasy sports sites, we also keep you informed after you start playing so that you never miss a good deal or money-making promotion. TDF team members are Daily Fantasy Sports players ourselves, so we’re able to provide viewpoints and site reviews that reflect our real experiences on the top Daily Fantasy sites. If you are brand new to Daily Fantasy Sports, be sure to check out our Intro To Daily Fantasy section. We’ll fill you in on what exactly Daily Fantasy Sports is, how to play and how to make sure you are getting the most extra money when you sign up for our top recommended sites. If you already know the basics of Daily Fantasy and just want to grab some extra cash before you join (we don’t blame you! ), head on over to our bonus and promo codes section. We exclusively offer you the top current bonuses and deals on the top sites – you won’t find a better deal anywhere online. 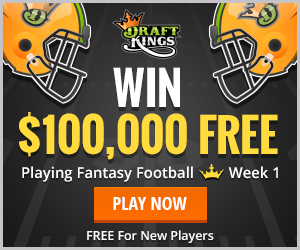 We also don’t want to just offer you a huge first bonus and leave you hanging for the rest of your DFS career. That’s why we’re always posting current promotions and reload bonuses so keep checking in to make sure you never miss out on any profit.We hope you find exactly what you’re looking for on TDF. If you need help with anything and you don’t see it on our site, we’d love for you to get in touch. We’re happy to help in any way possible.